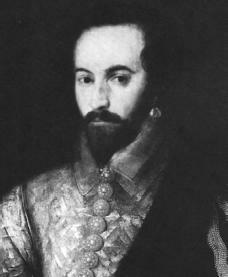 The English statesman Sir Walter Raleigh was also a soldier, explorer, and a man of letters (a distinguished writer). As a champion of overseas expansion into the New World, Raleigh was a victim of mistrust and Spanish hatred. popular with other poets of the Renaissance, a time of great cultural change led by the works of great artists and writers. After two years in obscurity, Raleigh accompanied his half brother, Sir Humphrey Gilbert, on a voyage apparently in search of a Northwest Passage to the Orient (Eastern Asia). The voyage quickly developed into a privateering mission against the Spanish, where Raleigh hired out his ship to attack the Spanish. On their return in 1579, Raleigh and Gilbert faced the displeasure of the Privy Council, the advisors to the King. Raleigh's behavior did little to please the council, and he was imprisoned twice in six months for disturbing the peace. Once out of jail, and at the head of a company of soldiers, he sailed to serve in the Irish wars. Extravagant in dress and behavior, handsome, and superbly self-confident, Raleigh rose rapidly at court, which consisted of the royal family and its advisors. His opinion of Ireland was accepted by Queen Elizabeth (1558–1603), and she kept him home as an adviser. He received royal favor as well, including a house in London and two estates in Oxford. Raleigh was knighted (given the honorary distinction of knighthood) in 1584 and the next year became the chief officer of the stannaries (or mines) in Devon and Cornwall, lord lieutenant of Cornwall, and vice admiral of the West. Although he was hated for his arrogance, his reforms (improvements) of the mining codes made him very popular. He sat for Devonshire in the Parliaments (meetings of the governing body of England) of 1584 and 1586 and then went on to succeed Sir Christopher Hatton as captain of the Queen's Guard—his highest office at court. By 1582 Humphrey Gilbert had organized a company to settle English Catholics in the Americas. Although forbidden by Elizabeth to accompany his half brother, Raleigh invested money and a ship of his own design to the mission. After Gilbert's death on the return from Newfoundland, a region that is now a province of eastern Canada, Raleigh was given a charter (authority from the queen) to "occupy and enjoy" new lands. Raleigh sailed as soon as he had his charter and reached the Carolina shore of America, claiming the land for himself. At the same time, Raleigh sought to persuade Elizabeth into a more active role in his proposed colonizing venture, which would settle lands newly discovered in America. Although unconvinced, she reluctantly gave a ship and some funds. Raleigh remained at court and devoted his energies to financing the operation. The first settlers were transported by Raleigh's cousin Sir Richard Grenville (1542–1591). Fights, lack of discipline, and hostile Indians led the colonists to return to England with Francis Drake (c.1543–1596) in 1586, bringing with them potatoes and tobacco—two things unknown in Europe until that time. John White (died c.1593) led a second expedition the next year. The coming of the Spanish Armada (a large fleet of warships) delayed the sending of supplies for more than two years. When the relief ships reached the colony in 1591, it had vanished. Raleigh sent other expeditions to the Virginia coast but failed to establish a permanent settlement there. His charter would eventually be withdrawn by James I (1566–1625) in 1603. In 1596 Raleigh and his court rival, Robert Devereux (1566–1601), led a brilliantly successful raid on Cadiz, Spain, and he seemed to have finally satisfied Elizabeth. He was readmitted to court, continued to serve in Parliament, held more naval commands, and became governor of the island of Jersey. With Devereux 's execution for treason (crimes against one's country), Raleigh's place as Elizabeth's favorite seemed secure. But the queen herself was near death, and Raleigh's enemies lost no time in poisoning the mind of James Stuart (1566–1625), her successor, against him. After James I took the throne, Raleigh was dismissed from his posts and forced out of his London house. Soon after, he was falsely connected to a plot against the king and was once again sentenced to the Tower, where he attempted to kill himself. Raleigh was sentenced to death, a sentence that would later be dropped. He was imprisoned for thirteen years. Raleigh attracted the sympathy and friendship of James's eldest son, Henry, who sought his advice on matters of shipbuilding and naval defense. Raleigh dedicated his monumental "History of the World," written during this period of imprisonment, to the prince. Henry protested Raleigh's continued imprisonment but died before he could effect his release. Freed early in 1616, Raleigh invested most of his remaining funds in the projected voyage to search for gold mines in South America. The expedition, which sailed in June of the following year, was a disastrous failure. No treasure or mines were found, and Raleigh's men violated James's strict instructions to avoid fighting with Spanish colonists in the area. Still worse, during the battle with the Spaniards, Raleigh's eldest son, Walter, was killed. Upon his return Raleigh was arrested once again. James and Sarmiento, the Spanish ambassador, wanted him tried on a charge of piracy, but since he was already under a sentence of death, a new trial was not possible. His execution would have to proceed from the charge of treason of 1603. James agreed to this course, and Raleigh was beheaded on October 29, 1618.